Coalition negotiations about 33. government of Israel came to an end after six weeks on Freb. 15Th 2013 when the election winners Yesh Atid and Bayit Yehudi both signed coalition agreements with ruling Likud Beytenu. The swearing-in of a new government will be in early this week – in just two days before the wheels of U.S. Air Force 1 touch down at Ben-Gurion International Airport with President Obama. The situation is pawing the way for new start for Israeli-Palestinian peace negotiations. The Israeli-Palestinian peace process has been at an impasse since the Palestinians pulled out of short lived final status talks in September 2010, after a ten-month Israeli settlement moratorium came to an end. Whilst Israel and Palestinian Authority both claim to support a negotiated two-state agreement, there is no trust between two sets of leaders, with each side doubting the other’s interest in reaching an agreement. In recent months both sides have taken steps deemed provocative by the other, with the PA seeking unilateral recognition at the UN, and Israel announcing new plans for settlement construction in sensitive areas of East Jerusalem and the West Bank. 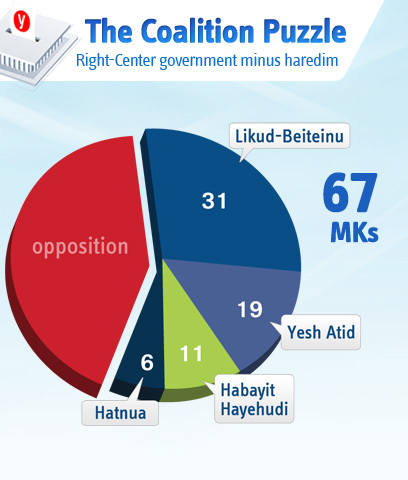 The new Right-Center government (Netanyahu’s and Lieberman’s Likud-Beiteinu, Yair Lapid’s Yesh Atid, Naftan Bennet’s Habayit Hayehudi and Tzipi Livni’s Hatnua) marks a significant change of direction for Israeli politics with the exclusion of the ultra-Orthodox parties and the entry of a range of disparate parties who agree on ending ultra-Orthodox exemption from national service and a better deal for the middle class.The roots of this transformation are in the social protest movement in the summer of 2011. The focus of the government will be socioeconomic issues, changing the electoral system, matters of religion and state, which topped the election’s agenda, and the security issues that were not brought up in the campaign because they were a matter of consensus.The new government encompasses a wide range of views on the peace process, from Tzipi Livni, who believes a deal is vitally in Israel’s interests, to Naftali Bennett, who rejects the two-state solution, while PM Netanyahu is somewhere between of them. Government’s combination of doves and hawks may help push peace process forward. To ease the blocked talks Israel is considering some gestures for PA during Obama’s visit. These gestures could be for example a specific transfer of land from Area C in the West Bank (which is under full Israeli control) to an Area A status (full Palestinian control). This concerns the transfer of the access roads planned to serve the new city of Rawabi, the first Palestinian planned city under PA rule, near Birzeit and Ramallah, with 10,000 homes, with a population of 40,000. An additional gesture under review is the approval of master plans for ten Palestinian settlements in the Israeli-controlled Area C. These are all Palestinian neighborhoods which today are considered illegal and concerning which the Civil Administration has issued demolition orders. 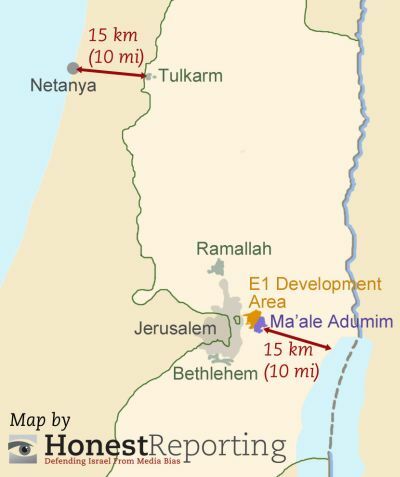 If these master plans are approved, these settlements will be connected to the infrastructure and all construction there will be approved.Two additional gestures are the release of a significant number of Fatah prisoners, arrested before the signing of the Oslo Accords; and the transfer of light ammunition to the Palestinian security forces. An interesting detail with Obama’s visit in Israel is, that his main speech will not be in Knesset. Instead the US administration announced that President Obama would be addressing university students at the Jerusalem International Convention Center. However rumors began to spread that they chose to sideline students who attend Israel’s newest academic heavyweight: Ariel University which unfortunately is located east of the Green Line. Ariel’s visionary, founder and longstanding mayor, the late Ron Nachman, often told journalists that “Israel is not a laboratory. We don’t have the luxury of experimenting with our future. One mistake and that’s it.” Instead of experimenting with political theory, Ron Nachman created a sustainable reality. He connected the nearby Arab villages to Israel’s electric and water lines and established industrial parks that provide thousands of Palestinians with employment. Ariel’s academic institution, which educates over 500 Arab students while conducting consistent joint research projects with Palestinian academic institutions received recently full recognition as Israel’s eighth and newest university. Settlements as obstacle of peace? Obama is willing to play “facilitating role” in peace process during Middle East trip. Considerable diplomatic pressure is now likely to build on Israel to offer gestures to the Palestinians in return for which the Palestinians would re-enter negotiations and hold off further unilateral steps. In the first year of his last term Netanyahu imposed a ten month settlement moratorium, and some measure to rein in settlement construction may come back onto the table. To improve better traffic flow between the northern and southern WB Israel has already made some investments. In October 2007, the Israeli government expropriated 1,100 dunams of land from four Palestinian villages to build an access road that was given the moniker “the Palestinian quality of life road.” Most of the territory was state property. The road was designed to provide for a freer flow of Palestinian traffic between the Ramallah area and Bethlehem. The northern sector of the highway, which runs from Hizma and bypasses Anata from the east, and continues southward toward the A-Zaim checkpoint, has already been paved. Israel invested about NIS 300 million in building the highway. The roadway passes through a tunnel that was dug underneath the Jerusalem-Maaleh Adumim highway. Moreover, Israel proposes to build tunnels or overpasses to obviate the need for Palestinians to detour to the east through the corridor. This time I see a good negotiation slot – a window of opportunity – between Israel and Palestine Authority. I think that now is the time to abandon the old fashioned principal that nothing is agreed until everything is agreed. Even if peace talks will start without any preconditions the parties involved have a common history and experience what has been agreed in previous negotiations. Tzipi Livni led Israel’s negotiating team on final status issues with the Palestinians under the Annapolis process in 2008. They were a detailed and extensive set of talks that made progress on a number of core issues, though with still significant gaps between the parties when the process was brought to an end by the collapse of the Olmert government. 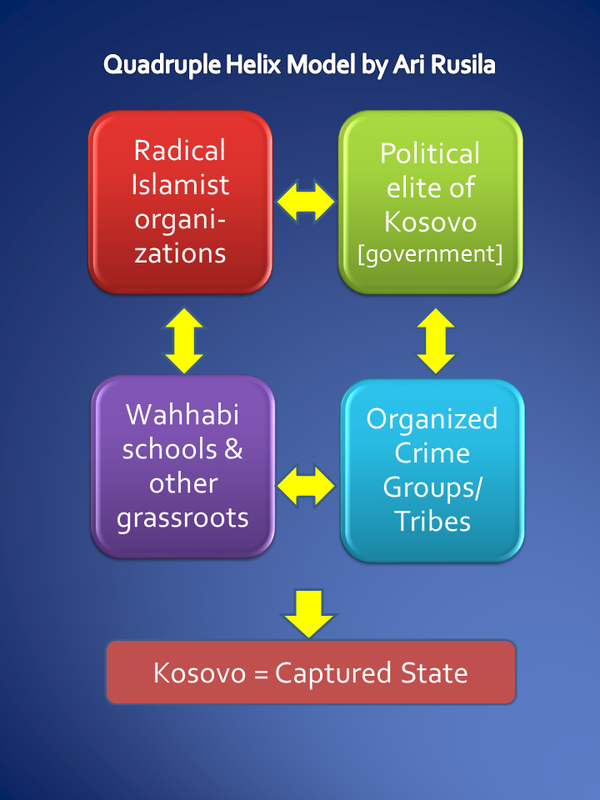 This process I have treated more in my previous article PaliLeaks, land swaps and desperate search of peace. a) Israel would annex 6.8% of the West Bank, including the four main settlement “blocs” of Gush Etzion (with Efrata, Ma’ale Adumim, Giv’at Ze’ev and Ariel), as well as all of the settlements in East Jerusalem (with Har Homa) in exchange for the equivalent of 5.5% from Israeli territory. b) The “safe passage” (i.e. 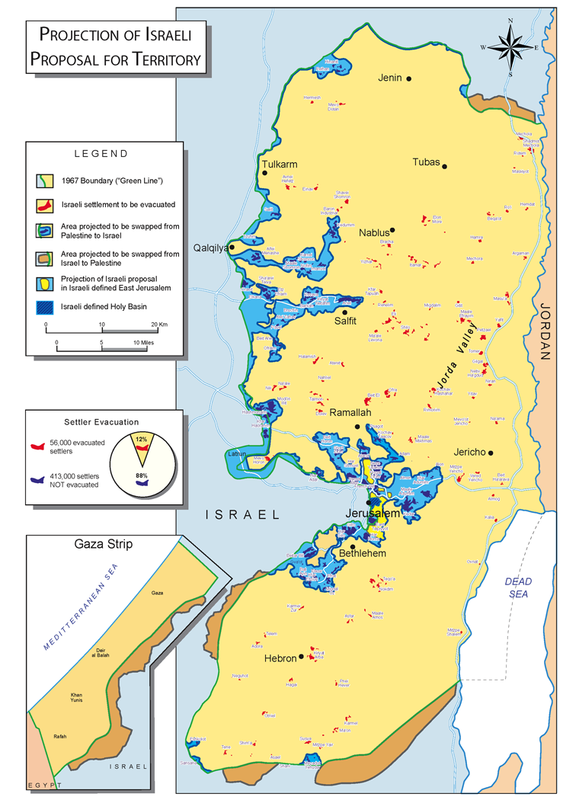 territorial link) between Gaza and the West Bank would be under Israeli sovereignty with Palestinian control, and is not included in the above percentages. c) There will be a special road connecting Bethlehem with Ramallah. thus by-passing East Jerusalem (most likely the same road currently planned around Adumim). d) Israel would take in 1,000 refugees per year for a period of 5 years on “humanitarian” grounds. In addition. programs of “family reunification” would continue. e) Israel would contribute to the compensation of the refugees through the mechanism and based on suffering. If the peaceprocess however does not start so the thread and the alternative scenario could be a unilateral actions of both sides: The Palestinians continue building the institutions of their state, gaining international recognition for their state, and Israel could withdraw from 60-70% of the West Bank and annex the rest officially to Israel. Supposedly the Palestinian Authority is in power there thanks to the presence of the Israel Defense Force. Ironically, ending Israeli “occupation” would also bring an end to Abbas’s rule. Palestinian Authority President Mahmoud Abbas does not have a mandate from his people to reach any agreement with Israel: his term in office expired in January 2009. Hamas claims that the U.S. Administration has been exerting pressure on PA President to refrain from signing any deal with Hamas. Another round of talks between Fatah and Hamas in Cairo few weeks before Obama’s visit failed to produce agreement on the formation of a new Palestinian unity government and holding presidential and parliamentary elections in the West Bank and the Gaza Strip. For Hamas, ending the dispute means the Islamist movement would have to cede exclusive control over the Gaza Strip — an area that has been turned into a semi-independent Islamic emirate over the past five years. As for Fatah, unity with Hamas means paving the way for the Islamist movement to extend its control to West Bank — something Abbas and his supporters are afraid of and cannot afford. One can wonder what are Abbas’ real motivations for declaring the “State of Palestine,” as it has been based on false hopes and the depravation of his own people. In the absence of real state-building and direct talks with Israel we will more likely see a third intifada (which many claim has already started with increasing demonstrations and violence on West Bank). However one mustn’t forget that Abbas is Israel’s closest neighbor, only 10 kilometers away from the Prime Minister’s Office in Jerusalem. Most interesting scenario from my point of view for new peace talks is the new pro-American Sunni Muslim-led axis which American diplomats established in Cairo on December 2012. In my opinion this axis makes views of Giora Eiland more feasible. This opens possibilities for alternative solutions instead of old brain-dead two-state solution and its road map. The process would then move towards a regional approach to the Israeli-Palestinian conflict in which Arab states take responsibility for solving the conflict and invest concrete, tangible resources in the solution. (More this in my previous article A Jordanian-Palestinian Confederation Is On The Move ) Indeed this kind of approach is quite near Three State (return) Option which I have been advocating long as the most pragmatic solution to Israeli-Palestinian conflict. One obstacle with this new approach could be a Jordanian national movement who are anti-Palestinian, more than most Israelis and Right Wing. They don’t want the West Bank, they want the Palestinians in Jordan to go back to Palestine. Therefore, they are the most emphatic supporters of the two-state solution. Not because they like the Palestinians, but because they dislike the Palestinians! However a way to circumvent this problem could be creation a Jordan-Palestine confederation. In my opinion Obama’s visit could lead to new jump-start of Israeli-Palestinian peace talks; besides Israel and Palestinian Authority President Obama will have discussions also with Jordan’s King Abdullah II. How Israel and PA will use – or will they use – this window of opportunity, remains to see. 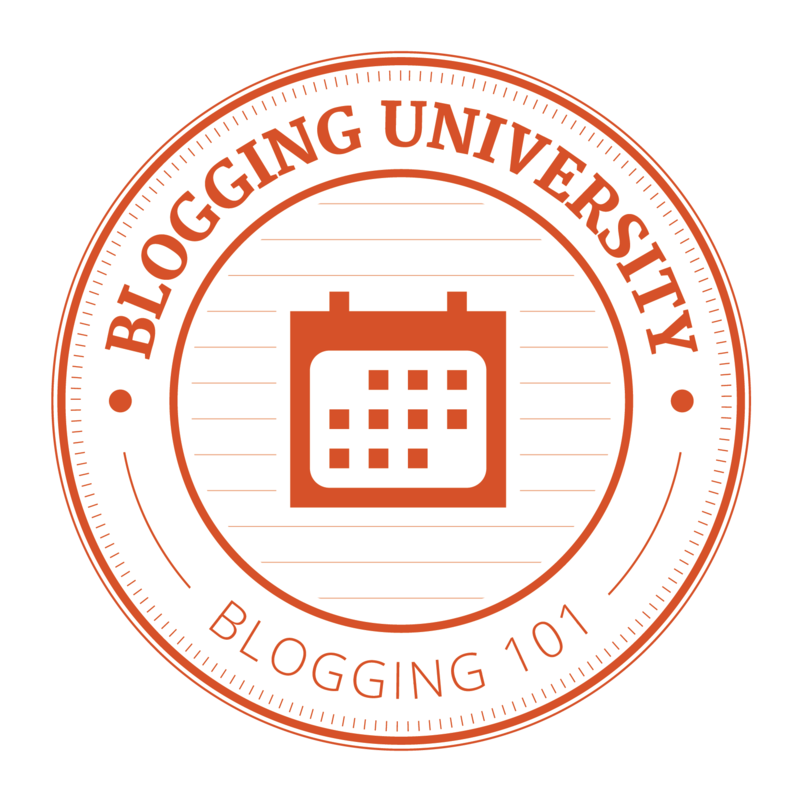 You are currently browsing the Conflicts by Ari Rusila blog archives for March, 2013.